MamaBreak: POPSUGAR Must Have Box September 2015 Inspiration & Coupon Code! POPSUGAR Must Have Box September 2015 Inspiration & Coupon Code! 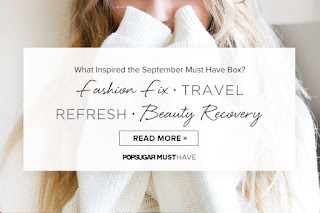 POPSUGAR released the inspiration for the September 2015 Must Have Box today! Let's check it out! These sound like great inspiration ideas for September! I especially love the photo of the woman wearing the cozy sweater in the background. It makes me want Fall to get here in a hurry! What do you think about the inspiration for the September 2015 POPSUGAR Must Have Box? Do you have any guesses about what might be in it? Comment below with your thoughts! I would love to hear them!